How Will Divorce Impact My Teen? 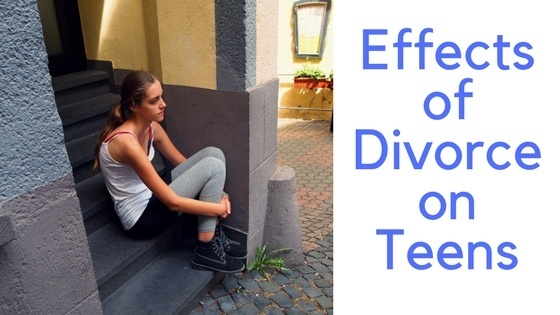 What are the Effects of Divorce of My Teen? You finally made the painful decision to divorce. You know it's the best choice in the long run, but worry about how it will impact your kids, especially your teenagers. They already face so many stressors. You wonder what extra burdens divorce will place on them. Most teens are social creatures. Peer activities don't just serve as entertainment; spending time with friends is an important way for your adolescent to learn to be more independent. Since most divorces involve some kind of shared custody, this can become difficult, especially when the two households are located in different towns. Your adolescent is often are more aware of how their choices may impact others than are their younger siblings. Your teen may feel as though time spent with one parent will come across like they are "choosing" that parent, particularly when they are old enough to have some say in where they spend their time. Making plans for holidays and special occasions can feel loaded, especially if you and your ex do not get along well. When your teen lives in two households, it can feel overwhelming when expectations differ in each home. Your adolescent may test you by questioning why things may be more important to one parent than the other, and by deciding that what matters to you might not be of consequence to them. You knew the day would come when your teen would seek more autonomy; you just didn't know it would happen so soon. While you may not be ready, it's important for your adolescent to know that you support their development, and will be there when they need you to be. With divorced parents, your child may struggle to feel secure in knowing that the system will be there for them. Adolescents are infamous for pushing boundaries, and yours probably will not be an exception. Predictability is especially important during this developmental age. Knowing that every behavior will lead to a consequence, and understanding what the consequences will be, is crucial to learning appropriate behaviors. When things are unpredictable, your teen may push boundaries even further if they suspect they can get away with it. During adolescence, your teenager is becoming more aware of the nature of both friendships and romantic relationships. Your adolescent may start to question what commitment looks like, and to worry about the loss of their relationships. This can impact their ability and willingness to connect with others. 1. Remember that social interactions are especially important during this developmental stage. Even though missing a movie night with friends may sound trivial to you, it can feel like a disaster to your teen. Taking their social life seriously and making appropriate compromises will show your child that you recognize the struggle. 2. The best thing you and your ex can do to keep your teens from feeling like they are caught in split loyalty conflicts is to work through your own feelings of anger and betrayal. Whether in individual or co-parenting therapy, a counselor can help you understand how your reactions can impact your child. 3. Even when living under the same roof, you and your spouse probably had different priorities when it came to the rules for your kids. Divorce can make co-parenting even more difficult, but is crucial for helping your teen make sense of the rules and expectations. Seek out the support of a co-parenting expert. 4. Help your adolescent find the right balance between autonomy and dependence on you. Your teens may be ready for you to start loosening some rules, while at the same time, enforcing boundaries gives them predictability and safety that will help them feel safe to engage in the world around them. 5. It's not appropriate to share all the details of your divorce, but it may be beneficial for your teen to understand that the circumstances of your relationship do not generalize to every other relationship. Point out that other relationships in your life have continued despite the ending of your marriage. Invite your adolescent to ask questions, but feel comfortable setting boundaries around which questions you feel comfortable asking. The article was written by Linda Hershman, LMFT and Jamie Smith, LMFT. Want to legally-document your decisions around your teen as co-parents? Create a healthy parenting plan. Divorce is a new and scary experience for everyone in your family. The counselors at the Couples and Family Wellness Center in Berwyn, PA are specially trained to ease the transition. We are a group practice of Licensed (and pre-licensed) Marriage and Family Therapists who provide individual counseling for adults, teens, and tweens; family therapy; co-parenting skills training for divorcing parents; and Discernment Counseling for couples who are unsure whether to work on the marriage or divorce. To schedule an appointment or a free 15-minute consult, contact Linda Hershman at 610 889-2089, email therapy@couplesandfamilywellnesscenter.com or visit online. Couples and Family Wellness Center is a member of Main Line Family Law Center's Divorce Support Network.